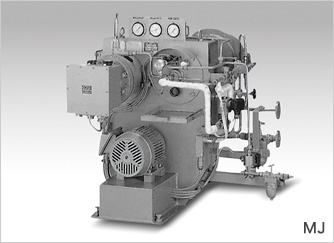 We have a wealth of experience dealing with burners and other systems used on vessels: from boiler burners used for the main propulsion engine on large LNG carriers, to auxiliary boiler burners used as heat sources within the vessel, as well as waste liquid incinerators, and bilge / slush treatment systems. We offer products with excellent energy savings and environmental performance in conjunction with a global service network in order to support safe and efficient marine transport. 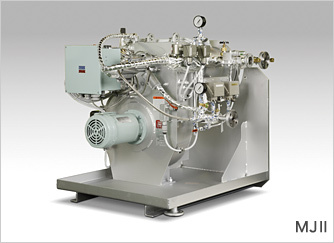 This burner was designed and developed for the auxiliary boilers on LNG Fueled vessels and supports both oil and gas. 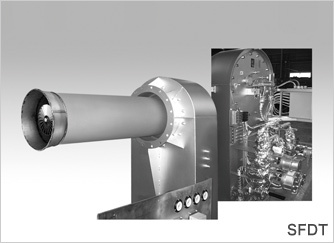 We developed this burner based on our experience with SFFG II burners used for the main boilers on LNG carriers and with MJ burners as all automatic mini-jet burners used for composite boilers/auxiliary boilers. Not only can this burner be configured for single-fuel combustion in both oil and gas applications, but it can also be used for mixed combustion to help saving energy and reduce the impact on the environment. This burner satisfies the boiler evaporation 1.0t to 3.0 t/h. 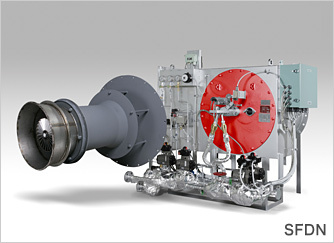 Tri-Fuel burner can support all HFO, MGO and LNG types. Up to 5 different combustion modes can be configured and used: all types of single-fuel oil combustion, single-fuel gas combustion as well as oil / gas mixed combustion In the oil / gas mixed combustion mode, the mixed combustion ratio can be set freely, making more economical operation possible. Mixed combustion can help saving energy and reduce the impact on the environment. Compact-sized Gas valve unit can save the space, is easy for maintenance and has the structure durable for high-pressure. High performance control system with PLC-instrumentation improved its reliability. 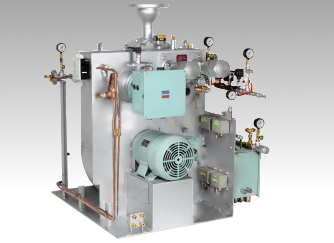 This burner was designed and developed for the auxiliary boilers on LNG Fueled vessels and supports both oil and gas. 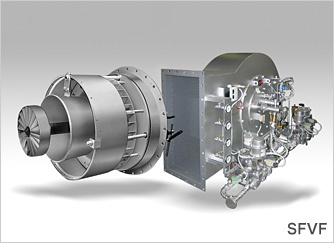 We developed this burner based on our experience with SFFG II burners used for the main boilers on LNG carriers. Not only can this burner be configured for single-fuel combustion in both oil and gas applications, but it can also be used for mixed combustion to help saving energy and reduce the impact on the environment. This high performance burner adapts flexibly and can support any future changes in fuel types. Energy saving operation is possible with a turndown ratio of 10:1. 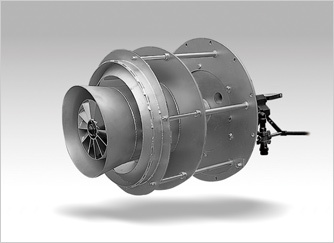 A specification option is available with burner’s slight adjustments in order to reduce the NOx emissions further. This burner uses proportional control for efficiency and energy savings. It not only supports heavy oil (HFO) but can also be used with a variety of oils, including MGO that is compliant with SOx regulations. This compact, packaged burner integrates the fuel pump, heater, fan and other components all into one unit. This burner offers proportional control with a turndown ratio of 3:1 and energy saving operation. The switch type supports HFO/MGO. It uses flexible tubing to simplify sprayer maintenance. It supports combustion for a variety of oils, from MGO to heavy oil with a viscosity of 700 cSt. This compact, packaged burner integrates the fuel pump, heater, fan and other components all into one unit. This burner was designed and developed for small auxiliary boilers and composite boilers. It not only supports heavy oil (HFO) but can also be used with a variety of oils, including MGO that is compliant with SOx regulations. The MJ type was launched in 1977 and the MJ II, based on the performance of the MJ, has become our best seller after being launched in 2008. The simple design makes maintenance easy. 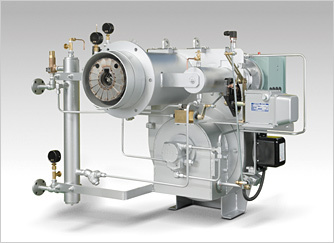 This burner is equipped with automatic combustion control (ACC) as well as various attachments, such as a window box, pilot burner and fuel shut-off valve. It uses a vapor spraying method, which can support the tightening of regulations (for NOx and SOx, etc.) in the future by replacing the atomizer. It not only supports heavy oil (HFO) but can also be used with a variety of oils, including MGO that is compliant with SOx regulations. Combustion for waste oil is also possible by adding a sprayer as an option. This is a compact and semi-packaged burner. It has a large turndown ratio and supports energy saving operation. Combustion for waste oil is also possible by adding a sprayer as an option. This “Energy Saving Burner” is our environmentally friendly burner. It supports a wide range of low oxygen conditions, contributing to energy savings as well as reducing the impact on the environment. It uses a vapor spraying method, which can support the tightening of regulations (for NOx and SOx, etc.) in the future by replacing the atomizer. It not only supports heavy oil (HFO) but can also be used with a variety of oils, including MGO that is compliant with SOx regulations. It supports a wide range of low oxygen conditions (boiler load ratio 20 to 100% when O2 is 2.0%). Energy savings and reduced environmental impact (low O2, low NOx and low dust and particulates). Energy saving operation is possible with a turndown ratio of 15:1 (evaporation rate 20.0 to 55.0 t/h). Combine it with a small capacity atomizer to achieve a 25:1 turndown ratio and even greater energy savings. Single and multiple burner configurations are available (Multi-burners for a boiler available). These burners are used on large boilers and has a simple design for easy maintenance. It uses a vapor spraying method, which can support the tightening of regulations (for NOx and SOx, etc.) in the future by replacing the atomizer. It not only supports heavy oil (HFO) but can also be used with a variety of oils, including MGO that is compliant with SOx regulations. 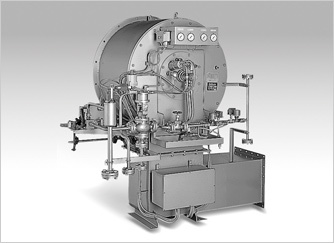 This large boiler burner can support single and multiple burner configurations (multi-type available). It supports low oxygen operation (O2 is 2.8%) and stable combustion despite low flow pressure. With a turndown ratio of 10:1, it offers energy saving operation and supports extreme load variation in boilers. It uses a vapor spraying method, which can support the tightening of regulations (for NOx and SOx, etc.) in the future by replacing the atomizer. Combine it with a small capacity atomizer to achieve a 19:1 turndown ratio and even greater energy savings. 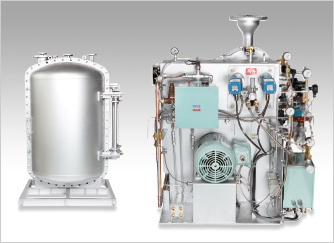 Oil/Gas combination burners for auxiliary boilers "Vignis-mini"
Oil/Gas combination burners for auxiliary boilers "Vignis"